Tyron Woodley may have lost the welterweight championship at UFC 235 but his mom won the day. She ran in to new champ Kamaru Usman and reminded us of the caring human beings are capable of. With a hug and some kind words she made Kamaru’s night and our day. Check out this amazing moment. "It's all good, baby. It's all good. It's your turn. It ain't his turn. "@Usman84Kg & Woodley's mother shared a beautiful moment backstage after #UFC235. 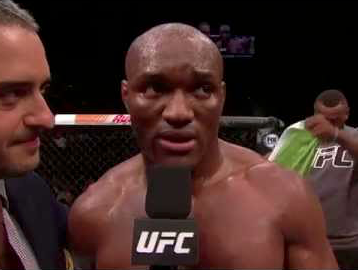 If you would have told me a week ago that Kamaru Usman would have dominated now former welterweight champion Tyron Woodley all five rounds at UFC 235 – I might have slapped you. It happened and Usman is the new champion leaving Tyron making a plea for a rematch. Check it out. On Episode 4 of UFC 235 Embedded, light heavyweight champion Jon Jones stays focused by watching opponent Anthony Smith’s interviews. Welterweight title challenger Kamaru Usman gets custom meals for the week at the UFC Performance Institute, where training partner and former champion Rashad Evans runs into several of his past opponents. Jones has a friendly interaction with former rival Evans and meets French heavyweight Francis Ngannou. 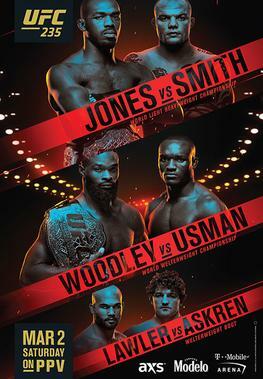 Teammates Tyron Woodley and Ben Askren continue to train together in Las Vegas, Woodley for his welterweight title defense and Askren for his Octagon debut. Former bantamweight champion Cody Garbrandt introduces welterweight Diego Sanchez to his secret weapon – his son. On Episode 2 of UFC 235 Embedded, welterweight title challenger Kamaru Usman puts his endurance on display during a New York City media tour and takes a call from lightweight champion Khabib Nurmagomedov. Light heavyweight title challenger Anthony Smith sneaks in some Big Apple sightseeing between interviews. On the opposite coast, welterweight champion Tyron Woodley and debuting welterweight Ben Askren talk about their history as teammates and friends. Light heavyweight champion Jon Jones puts in a hard workout, then clears his mind with some high-altitude outdoor time. Watch Friday’s UFC 235 ceremonial weigh-ins live stream kicking off at 7 p.m. ET/4 p.m. PT from Las Vegas. 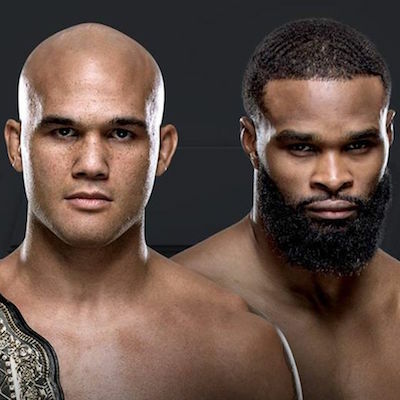 Light heavyweight champ Jon Jones and challenger Anthony Smith will face-off ahead of their main event championship bout, and welterweight champ Tyron Woodley will come face-to-face with his challenger Kamaru Usman. 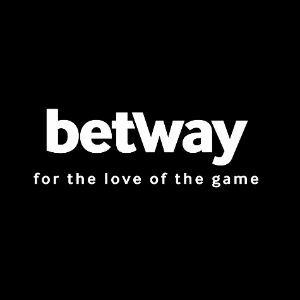 UFC 235 also features the octagon debut of Ben Askren as he gets a tall order in former welterweight champ Robbie Lawler. Episode 1 of UFC 235 Embedded features light heavyweight champion Jon Jones training for his upcoming title defense while his challenger Anthony Smith embraces the mild weather and hostile drivers of the East Coast after escaping a Nebraska blizzard. Also, Kamaru Usman sharpens his tools for his welterweight title bout against champ Tyron Woodley and goes dress shopping with his daughter. Take a look at all-access, behind-the-scenes footage leading up to the two world title fights taking place at UFC 235 on Saturday, March 2nd on Pay-Per-View.